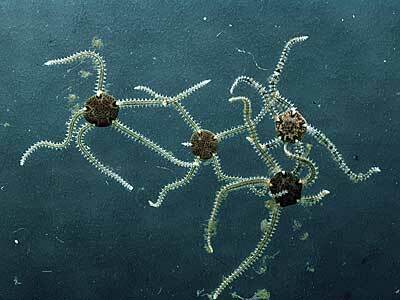 Description: A small inconspicuous brittle star found commonly amongst sessile invertebrates, beneath boulders, etc. The disc is circular and the arms relatively short and thin. The disc is covered with scales and the radial plates are half-moon shaped and conspicuous. There are four short conical arm spines and two tentacle scales. Disc 3-5mm., arms 4x disc diameter. Habitat: Found commonly amongst algae, bryozoans etc. intertidally and in shallow water and under shells, stones and boulders. Circular disc and spindly arms. Picton, B.E. & Morrow, C.C. (2016). Amphipholis squamata (Chiaje, 1829). [In] Encyclopedia of Marine Life of Britain and Ireland.